We understand that dental accidents and pain can occur at the most inconvenient time. We believe that nobody should have to wait to see a dentist when they are in pain and we make it a priority for same day emergency dental care. We understand that sustaining a dental injury can be both painful and traumatic, and we can help ease your fears as we treat your injuries. 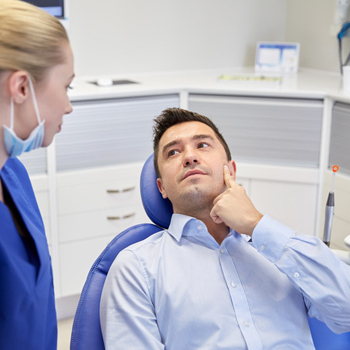 Our office is fully equipped with state-of-the-art equipment, including digital X-rays that enable our dentist to quickly and accurately treat your dental pain. We take your comfort seriously, to ensure that you feel as relaxed as possible while you’re being treated. If you are experiencing dental pain for any reason, you can call our friendly staff at (250) 586-6677 during business hours. If you prefer to book online, you can click below to request an appointment, and a friendly member of our team will quickly call you to confirm your appointment. What is a Dental Emergency ? Sometimes it can be hard to know whether something qualifies as a dental emergency. At PQB Dental Clinic, we like our patients to be informed so they know when they need to make an appointment. Our general rule of thumb is this: If it hurts, it’s an emergency! Pain is your body’s way of telling you that something is wrong, and we don’t think you should ever ignore it. The fact is that even seemingly minor injuries or pain can lead to major dental problems if you don’t take care of them right away. If you experience any of the above symptoms, you should call PQB Dental Clinic immediately to make an appointment.